Australia is a vast country, and the best way to appreciate it’s sheer size and beauty is by train. There’s no better way to cover the long distances between capital cities and see the stunning countryside than in the comfort of Australian trains. In fact Australia is famous for its train journeys, particularly the 3 day Indian Pacific which connects Sydney and Adelaide with Perth and crosses the Nullarbor Plain. 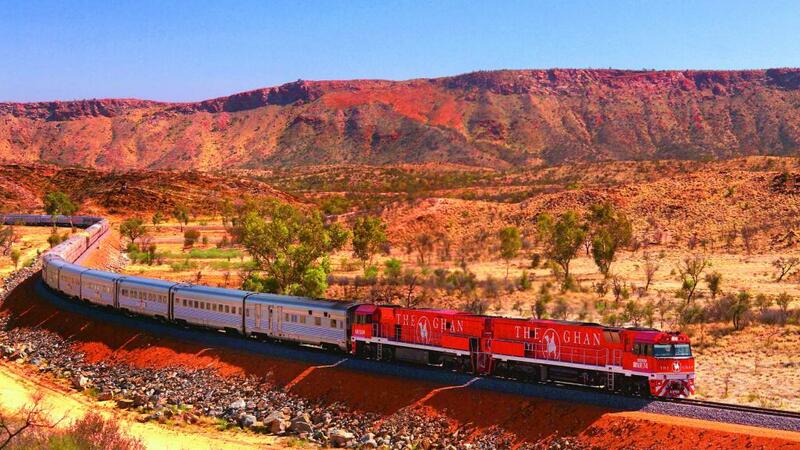 The Ghan is another iconic Australian rail journey that travels from Adelaide all the way up to Alice Springs and Darwin, taking in the incredible ‘Red Centre’. There are also a number of easy and affordable rail journeys that travel the east coast of the country. Connecting some of the most popular coastal destinations in Queensland, the Tilt Train services stops from Brisbane to Rockhampton. Offering both business and economy class, Tilt Train passengers can enjoy onboard entertainment and meals making it a comfortable and flexible travel option. One of the longest train journeys in the world, the Indian Pacific spans the continent of Australia and stretches from the Pacific Ocean in the East to the Indian Ocean in the West. Passing through historic townships and rural countryside, the train journey travels through the Blue Mountains, Bathurst, Broken Hill and the Nullarbor Plain before arriving in Perth. A great way to enjoy the diversity of Australia’s vast landscape, passengers can board The Ghan in either Adelaide or Alice Springs. Explore the spectacular Top End in comfort and style and choose from two different service levels of sleeper cabins or daynighter seating. Discover the Queensland outback on this 1300km journey that passes through scenic surrounds. Fully air conditioned, the Spirit of the Outback offers both seating and overnight accommodation options that range from economy to first class. Connecting the major capital cities of the east coast, TrainLink offers a modern fleet of XPT’s that carry passengers between Brisbane, Sydney and Melbourne. Travel in air conditioned comfort in either economy or first class seating, with sleeper facilities available on overnight routes.